The British government’s draft Brexit deal was again roundly defeated in Parliament. 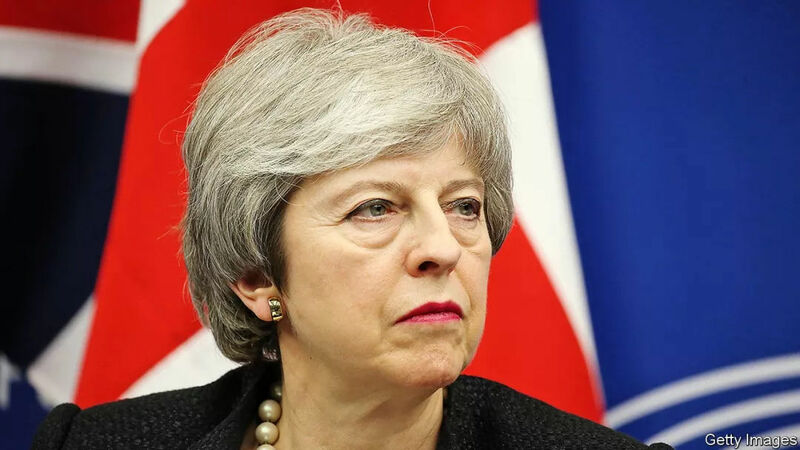 The prime minister, Theresa May, had won assurances from Brussels that the “backstop”, which would keep Britain in the EU’s customs union to avoid a hard border in Ireland, was temporary, but this failed to satisfy Brexiteers. MPs also voted against a no-deal Brexit. Two German journalists were forced to leave Turkey after President Recep Tayyip Erdogan’s government refused to renew their accreditation. Mr Erdogan has successfully tamed Turkey’s media. He has now trained his sights on the foreign press. Estonia’s prime minister, Juri Ratas, invited the anti-immigrant EKRE party to coalition talks, reversing a promise not to deal with the group. Finland’s government resigned ahead of a general election next month. Protests continued in Algeria, where the ailing president, Abdelaziz Bouteflika, dropped his bid for a fifth term and postponed an election scheduled for April 18th. A conference tasked with sorting out Algeria’s political future is expected to be led by Lakhdar Brahimi, a veteran diplomat. Most Algerians believe Mr Bouteflika, who can hardly speak or walk, is a figurehead for a ruling cabal of generals and businessmen. The UN said that at least 535 and as many as 900 people were killed in fighting between two communities in the Democratic Republic of Congo in December. Investigators found that village chiefs helped plan the killings and that regional officials had not done enough to prevent the violence, despite warnings. The ruling party in Nigeria, the All Progressives Congress, took an early lead in state elections, strengthening the hand of Muhammadu Buhari, who won re-election as president in February. International observers said the poll was marred by violence. A malfunction at a hydroelectric dam in eastern Venezuela plunged most of the country into darkness for days, paralysing hospitals and destroying food stocks. Nicolás Maduro, the socialist dictator, blamed a Yanqui imperialist “electromagnetic attack”. Others blamed the government’s incompetence and corruption. America, one of many democracies that recognises Mr Maduro’s rival, Juan Guaidó, as the interim president, withdrew its remaining diplomatic staff. It also revoked the visas of 77 officials connected to Mr Maduro. Two former police officers were arrested in Brazil for the murder last March of Marielle Franco, a councilwoman in Rio de Janeiro. One of the suspects used to live in the same building as President Jair Bolsonaro and his daughter dated one of Mr Bolsonaro’s sons. The other appears in a photo with Mr Bolsonaro taken before he was president. The detective in charge of the investigation said that these facts were “not significant at this time”. Mr Bolsonaro said he had posed with thousands of policemen. Five pupils and two teachers were shot dead by two former students at a school on the outskirts of S?o Paulo. One shooter then killed the other and turned the gun on himself. India’s Election Commission announced that voting for a new parliament will take place in seven phases in April and May. There will be 1m polling stations for the country’s 900m-odd eligible voters. Narendra Modi’s Bharatiya Janata Party is seeking a second five-year term in government. The results will be announced on May 23rd. A court in Australia sentenced George Pell, a cardinal and former senior Vatican official, to six years in prison for molesting two altar boys in 1996, when he was Archbishop of Melbourne. Mr Pell is the most senior member of the Catholic hierarchy to have been found guilty of sexual abuse. Donald Trump presented a $4.75trn budget to Congress, which calls for a 5% increase in defence spending and cuts to a wide range of social programmes. It also seeks $8.6bn for his border wall. Democrats said it was dead on arrival, though that has been the case with presidential budgets for many years now. California’s governor, Gavin Newsom, issued a moratorium on executions in the state, beefing up a court-ordered moratorium that has been in place since 2006. Paul Manafort received an additional sentence of 43 months for conspiring to sway witnesses. That comes on top of the 47 months Mr Trump’s former campaign chief recently received for tax and bank fraud. After his sentencing, New York state filed separate charges against Mr Manafort. Milwaukee, a city renowned for its beer, beat Houston and Miami to host the Democratic convention next year. Meanwhile, Beto O’Rourke threw his hat into the ring to be the party’s presidential candidate; he came a close second in the Senate race in Texas last year.